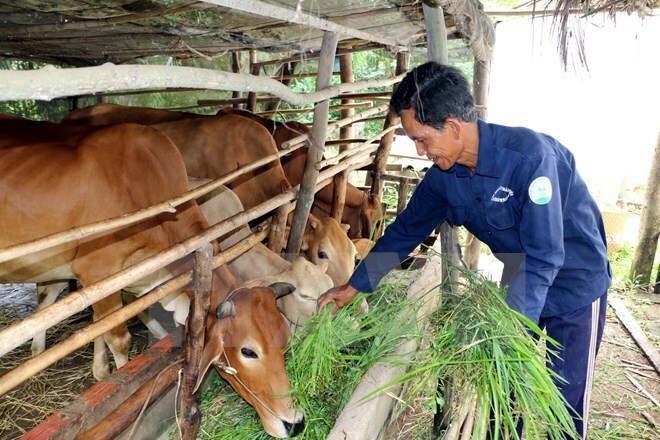 Ben Tre (VNA) – The Mekong Delta province of Ben Tre has implemented a plan with numerous programmes to help locals develop livelihoods and achieve sustainable poverty elimination from 2016 – 2020. So far, 8,928 poor and near poor households have joined the plan. After one year, those who have escaped from the poor status are still being supervised to ensure they achieve sustainable poverty elimination. Nguyen Thi Kim Thoa, Vice President of the provincial chapter of the Vietnam Women’s Union said, 754 out of 1,243 households of poor women have benefited from the plan, worth over 18.5 billion VND (814,000 USD). 60 of them have escaped from poverty. The Association has encouraged the wealthy ones to lend a helping hand to the poor, and provided saplings, labour force, and vocational training to help its poor members gain stable income. According to the provincial Department of Labour, Invalids and Social Affairs, the province has 37,541 and 17,395 poor and near poor households, respectively. The provincial branch of the Vietnam Bank for Social Policies has provided preferential loans up to 190 billion VND (8.36 million USD) for these poor and near poor households. In addition, the involved households also enjoyed social services, including health care, education, housing, and water supply. Nguyen Huu Phuoc, Vice Chairman of the provincial People’s Committee said the plan aims to help find suitable livelihoods for every local poor household. He urged levels, sectors to promote publicity campaign to enhance the awareness and self-respect of the poor to strive to get rid of poverty in the coming time.